This week marks International Workers Memorial Day - officially April 28 - so mark the day in some way. Also, because tomorrow, April 25, is Anzac Day, SafetyNet is being posted a day early. Please come to our event for International Workers Memorial Day (IWMD) this coming Friday April 27. Workers, HSRs, union organisers and the public are invited to attend, be witness to the putting out of boots and shoes to remember those killed in the past year, and participate in the flower laying ceremony. We will be starting at 10.30am outside the Trades Hall at the Memorial Rock on the corner of Victoria and Lygon St. Unions and workers stop every year to remember the dead: Worldwide, working conditions kill a worker every 11 seconds. Every death is avoidable. But we also re-commit to fighting for the living. The AFL-CIO (American Federation of Labor and Congress of Industrial Organizations) has published a Workers Memorial Day Toolkit [pdf]. It includes talking points, sample materials for media outreach, worker safety and health facts, state-by-state safety and health data and other information. There are some fabulous resources which you can download and use in your own workplaces. On 24 April, 2013 the Savar building collapse or Rana Plaza collapse occurred in the Savar Upazila of Dhaka District, Bangladesh. The collapse killed 1,135 people and injured over 2,500. It was the deadliest garment-factory tragedy in history. The building's owners ignored warnings to avoid using the building after cracks appeared and ordered garment workers from several factories located in the building to return the following day. Global trade unions and labour rights organizations are calling on all brands sourcing from Bangladesh to take responsibility for workers making their products by signing the renewed Bangladesh Accord on Fire and Building Safety. The 2018 Transition Accord takes over the work of the current Accord when it expires in May and will ensure that work continues to improve factory safety – the remediation progress rate across all currently covered Accord factories is 84 per cent. Global labour organizations are demanding that all brands producing in Bangladesh sign the 2018 Transition Accord. So far, 144 global brands have signed the new 2018 Accord, covering more than 1,300 factories and approximately two million workers. There is an action today, at 5.30pm at the 8 Hour Monument at the corner of Lygon and Victoria Streets, Carlton South - opposite the Trades Hall Building. Apologies for the short notice - but please come if you are able to. Read more: The Guardian; The Dhaka Tribune. Rana Plaza documentary The Deadly Cost of Fashion. Clean Clothes Campaign - Rana Plaza. IndustriALL Media Release: Five years after Rana Plaza, the need for Bangladesh Accord persists. Recently two of the covers from the ceiling fluorescent lights in my work area have fallen off and been removed. The light intensity seems much higher and I'm finding it is bothering me. Is there a risk to my eyesight if I continue to work in these conditions? In order to know whether the intensity is too high, the lux measurement would need to be taken but the fact that the lights are bothering you and this is because the covers/diffusers have been removed and not replaced is enough for you/your elected HSR to raise this as an issue with the employer (or the OHS management rep). Under the general duty of care the employer has a duty to provide and maintain a working environment that is safe and without risks to health, so far as is reasonably practicable. This includes maintaining plant and equipment. (see this page: Duties of employers) So why haven't these light diffusers been fixed? They were clearly there for a purpose! Go to your HSR and ask him/her to follow this up. See also this advice on lighting - it sets out what the Compliance Code states. If you've been bullied at work, or know that bullying is happening at your workplace, then you will know that it can make life intolerable. Unfortunately it happens too often in our workplaces. Are you passionate about health and safety? Are you interested in joining our team? There are two positions being advertised - both positions are based within VTHC's Occupational Health & Safety (OHS) Unit. The OHS Unit works with unions and external stakeholders across the community to identify Victorian workplace safety and rights issues. Applications close today, April 24. The bi-annual Anna Stewart Memorial Project (ASMP) is coming up from 7-18 May, and the We Are Union Women's Team at the VTHC are looking for women who are motivated to support other women in forming a critical voice and influence the culture of a workplace. 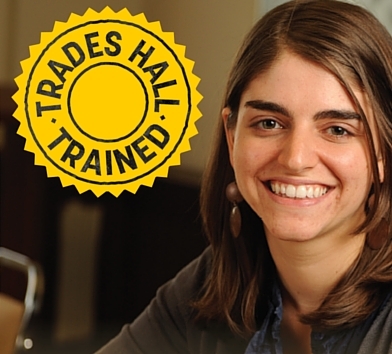 Designed to encourage more women to be present and active in unions, the Anna Stewart Memorial Project is a structured, two-week-long internship program consisting of two days each week at Trades Hall, with the remaining days in a union of choice. Join Indonesian activists Bono (General Secretary SERBUK Union), Darisman (Local Initiation for OHS Network – LION Indonesia) , Kate Lee (Chief Executive Union Aid Abroad APEHDA) and Ged Kearney (Federal Member for Batman) in a co-hosted public event with Labor for Aid to hear about the Asbestos. Not Here. Not Anywhere campaign in Indonesia and across the region. Union Aid Abroad supports an overseas aid program that addresses poverty and inequality, that is accountable and transparent and is primarily delivered by governments and not-for-profit organisations, not as a vehicle for making profits by business. We support the international standard of 0.7% a country's income being spent on international development, currently Australia is at 0.2% and we are campaigning with others to build political change for this goal. We are working with Labor for Aid on this speaking tour to bring the story of how aid can end asbestos use in Asia, in support of this aim. Truck filmed dumping asbestos wasteNSW authorities are trying to identify who dumped suspected asbestos at a residential address on Friday evening in north-western Sydney. Fire and Rescue services were called to an Oatlands home after a resident reported rubbish bags had been dumped by a truck onto their driveway. Please join us at the 2018 May Day Rally and Family Fun Day at Trades Hall. Time: Family fun and rides outside Trades Hall from 11am. Entries are now open for the 30th annual WorkSafe Awards. The role that all Victorians can play in making workplaces safer will be highlighted in this year's Awards. The Awards have been established to recognise health and safety reps, groups and businesses who have demonstrated excellence in workplace safety and wellbeing, as well as safety ideas and innovations. WorkSafe Chief Executive Clare Amies said this year's awards theme – "Play your Part: Celebrating 30 Years of What Matters Most," serves as a reminder that workplace safety is everyone's concern. The VTHC urges workers to nominate their own health and safety representatives - ordinary workers who have an extraordinary role in representing their fellow workers and making their workplaces safer and healthier. This is often a thankless role, so put your heads together and start nominating now! The latest Queensland alert is on an incident which occurred last month, when a 19 year old worker sustained fracture injuries to both kneecaps, partially severed fingers on one hand and a severe laceration to his calf when he fell approximately three metres from a roof. An edge protection system was installed around the roof perimeter. The system was erected by a scaffolder and consisted of a post and rail setup. Scaffold components were used to construct the edge protection system, specifically tube and coupler. Early investigations indicate there may have been a failure of a mid-rail which the worker was leaning against. The mid-rail has pulled away on one end at the coupler joint, resulting in the worker falling through the gap. Read more. The Fair Work Commission has published an updated interactive online version of its Anti-bullying benchbook. The benchbook contains plain English summaries of the key principles of workplace bullying case law and how these have been applied in Commission decisions. It is designed to provide information to parties to assist in the preparation of material for matters before the Commission. The new version of the Anti-bullying benchbook, incorporating recent updates, is designed to be read online and can be accessed on the Commission's website. A PDF version of the benchbook is also available for download. SWA has published a revised version of the Australian Work Health and Safety Strategy 2012-2022 to ensure it continues making a difference in Australian workplaces. SWA says that some minor language changes and more explicit reference to workplace bullying, harassment and occupational violence will keep the Strategy relevant for the next five years. The changes are the result of the Strategy's scheduled mid-term review which showed overall support for the Strategy to remain largely unchanged. PJL Building Group Pty Ltd, a small family owned company that is involved with construction and maintenance of domestic properties, was last week convicted and fined $25,000 and costs of $4725 over an incident on 16 February 2016 where an employee fell about 2.4 metres at a construction site in Springvale. Two packs of flooring were delivered to the site and the worker climbed from a ladder onto the frame of a partially built 2 story house to ensure that the flooring was put in the right place. However, the frame was incomplete and there was no process to check the structure before the flooring was loaded onto it. The first pack of flooring was loaded onto the frame, but when the second pack was loaded onto the first pack, the frame collapsed. The worker was treated in hospital for injuries to his thumb and a cut to his right forearm. He was unable to work for about six weeks. Cornerstone HR Pty Ltd, a labour hire company, was charged with breaching s21(1) and 21(2)(a) of the OHS Act over an incident in wich an employee placeda to work as a truck jockey with Kingspan Environmental Pty Ltd, a company that builds, sells and delivers steel water tanks and garden beds. In early September 2015, Kingspan directed the worker to move from the position of truck jockey to the factory floor as a production worker and operate the GLK Manual Curver ("the Curver") - used to bend corrugated steel to form water tanks. The Curver had two vertical rollers with stop pull wire switches either side of the rollers but no guarding to prevent bodily access to the danger points of the machine. Cornerstoner did not check the work their employee was to perform nor properly assess those activities for risks to his health and safety; nor did it liaise with Kingspan regarding the risks and the means to control those risks. On 17 October 2015, while feeding a sheet of metal into the rollers of the Curver, the worker's hand was caught in the in-running nip point of the rollers. The trip wires did not operate to shut the machine down so he was able to extract his hand by reversing the direction of the rollers. However, he sustained injuries to his thumb, first and middle fingers of this left hand which required surgery. Cornerstone was found guilty and was without conviction fined $15,000 plus costs of $15,000. Australian Precast Pty Ltd manufactures precast concrete panels. On 19 December 2016 a WorkSafe inspector attended the workplace and observed twelve precast concrete panels each measuring 2.8 metres x 3 metres x 450 mm and weighing approximately 9 tonnes freestanding vertically on the concrete floor. The company had storage areas for concrete panels at the workplace but these were full. The concrete panels were not positively restrained. Bridge cranes were available for use within the area where the concrete panels were freestanding and forklifts were in operation at the workplace. Employees used walkways around the area where the concrete panels were freestanding. There was a risk of death or serious injury to employees from the concrete panels tipping and falling due to impact between mobile plant and the concrete panels. The offender pleaded guilty and was without conviction sentenced to pay a fine of $15,000 and to pay costs of $5,335. Criminal charges have been dropped against Montreal, Maine & Atlantic Railway (MMA), according to Quebec's Director of Criminal and Penal Prosecutions (DPCP). The firm had been accused of causing the deaths of 47 people when 73 train cars of highly combustible crude oil derailed in the small Quebec town of Lac-Mégantic in 2013, turning the downtown into a raging inferno. MMA locomotive engineer Tom Harding, 56, rail traffic controller Richard Labrie, 59, and operations manager Jean Demaître, 53, were tried on 47 counts of criminal negligence causing death — one count for each of the victims of the rail disaster. In January this year, a jury acquitted the three MMA employees after the defence argued successfully that the rail workers were being blamed for the consequences of poor regulatory oversight and a clear failure of the rail firm to establish and enforce safe procedures. Much of the case was based on a 2014 Canada Transportation Safety Board report that documented MMA's "weak safety culture" and faulted Transport Canada for lax oversight of the carrier. MMA has since declared bankruptcy. DPCP said it no longer believes there is enough evidence to obtain a guilty verdict against MMA, which operated the train. Prosecutor Marie-Ève Phaneuf said: "With their verdict, the jurors sent a message that, by their assessment, the company's agents had not behaved in a manner that markedly deviated from the standard of care that a reasonable person would have adopted under the same circumstances." But a former top US safety official, Jordan Barab, disagrees. "The workers were acquitted precisely for the reason that the company's safety culture was guilty of causing the catastrophe," he wrote in his Confined Space blog. "The main successful charge against the company was a $1 million fine for polluting Rivière Chaudière and Lac Mégantic under the Canadian Fisheries Act. The money will go toward cleaning up the lake and river. The 47 human victims were not as lucky as the fish." Samsung Display and its parent company, Samsung Electronics, have filed legal action in South Korea in an attempt to prevent the disclosure of potentially damning workplace assessment reports. Samsung has claimed that publicising reports on its production facility in Asan would reveal company secrets – and therefore is not premitted. However, Samsung's legal action seems to be motivated by the revelation of serious labour violations in the company's production facilities. A former employee at the site in Asan has sued Samsung after being diagnosed with a rare form of lymphoma. The employee also sent a petition to the Ministry of Employment and Labour for the release of factory information, claiming she can prove the disease was caused by exposure to toxic chemicals used in the production line. So far, the ruling is in favor of Samsung's claims. However, Samsung is also tied to similar disputes over the disclosure of information, with a request for the release of information regarding a case of worker poisoning in 2014. This raises questions over what Samsung is trying to hide in its production facilities.